Is it raining where you live? It’s been raining here for days and days and there’s more on the way. Umbrellas for all! Here are some food highlights from the first half of the week! 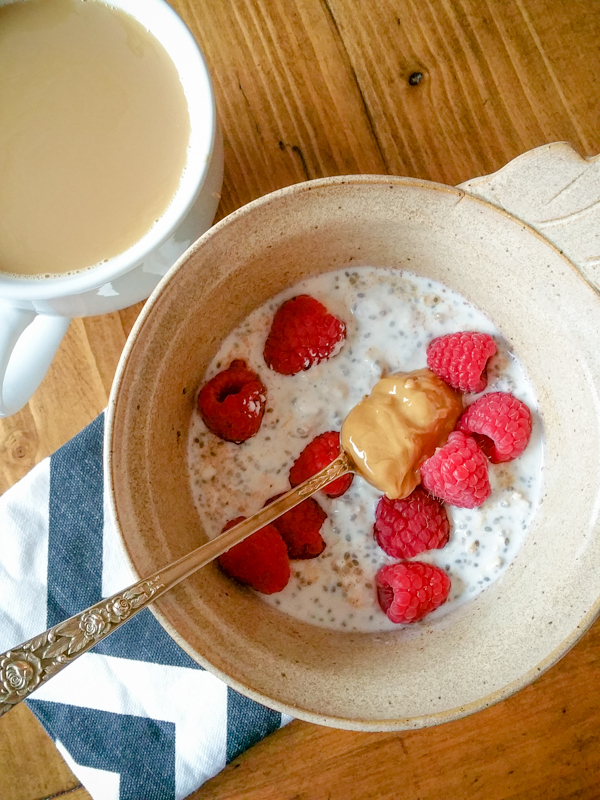 Overnight oats with raspberries and peanut butter. Simple. Delicious. Lunch at Roots Natural Kitchen! I met a friend at this relatively new spot located on the UVA corner. It’s not easy to get to (involves parking in a garage), but boy was it worth the visit!!! This is now one of my top lunch spots in town. They are either kale or grain based, and the ingredients and dressings are all so good!! 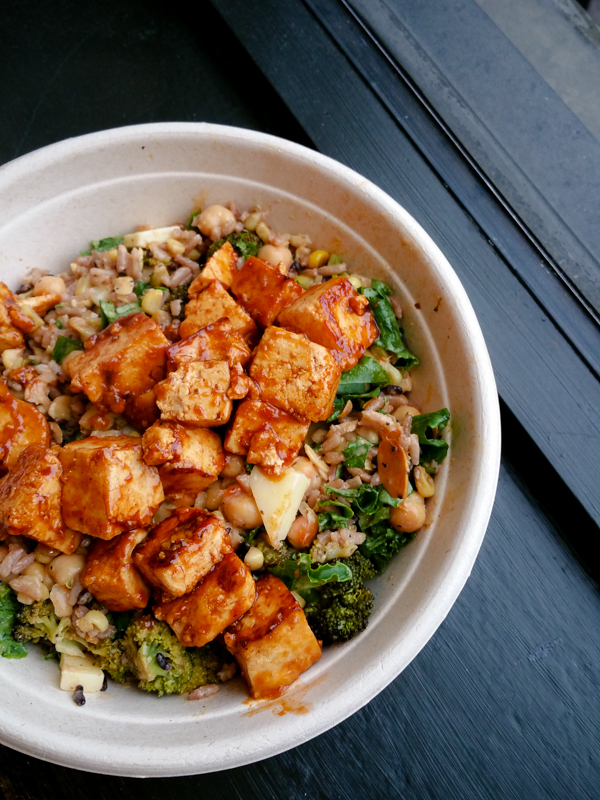 I got The Southern with a rice base and BBQ tofu – it was outstanding!!! Another day for lunch I had a mug of leftover chili with pimento cheese melted in. Why have I not though to do this before!? And finally, a working lunch at Paradox. They have a special where you get a side salad, soup and cookie for $9. 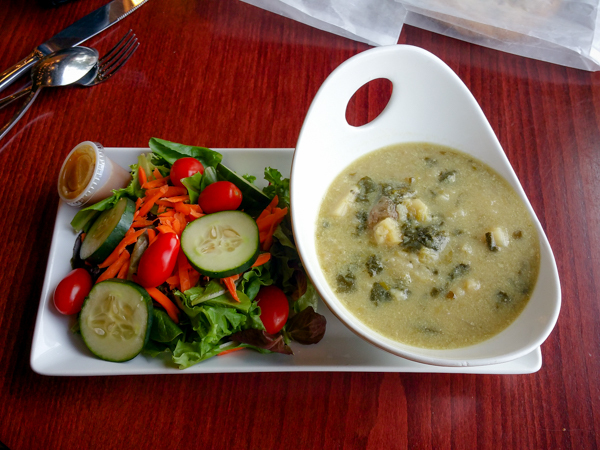 I had this potato spinach soup and half of a Hot Toddy cookie for dessert! 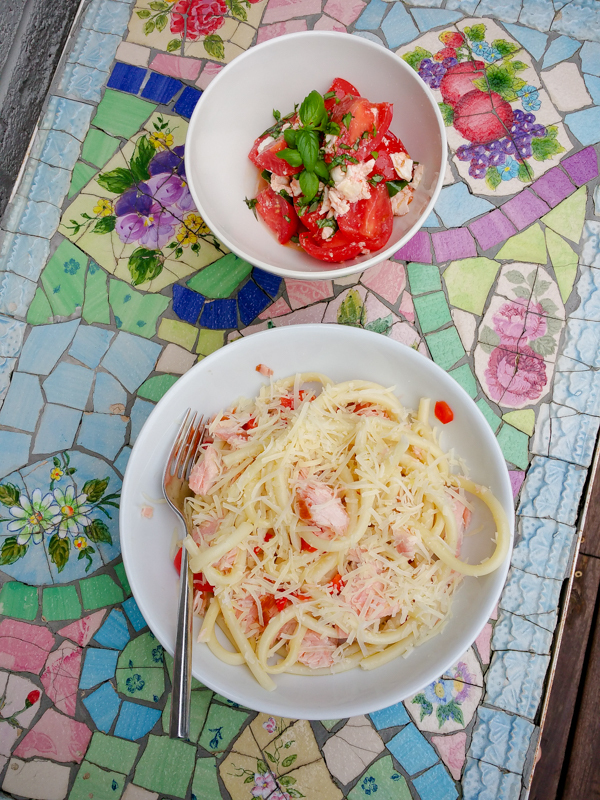 For Karen’s last night here (yes, I am totally kicking myself for not taking any cute photos of her) we made a really interested tubular pasta with smoked salmon and red peppers plus a caprese salad on the side. And finally, I found these guys at Whole Foods. Near the butter shelf, naturally! They are little layer cakes in a jar. They were $4 and 370 calories a pop, but I HAD to try them! They come in about 8 different flavors, including salty caramel and chocolate. The good news is they are rich, so you can have a single bite of cake after dinner and be satisfied. I’ve only had a bite of the vanilla and it was fab! I’ll give you an update when I try more! I just spent way too much money on way too many calories, but I had to try these!! Cake in a little jar. That BBQ tofu looks good! 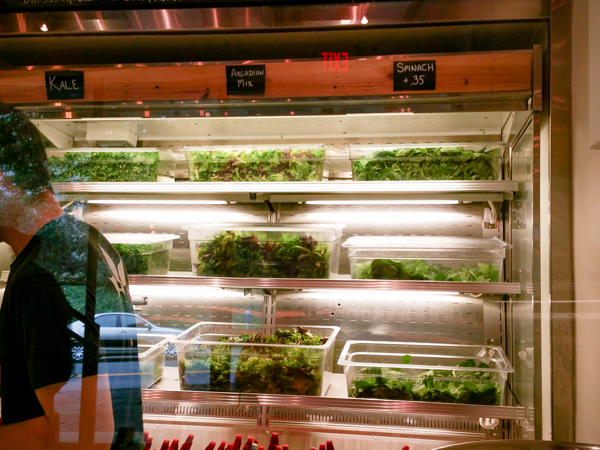 I love restaurants like that – reminds me a little of my fave Sweetgreen in DC! All the food looks amazing…. did you leave out the pickled onions in your Southern bowl 🙂 ?? Also, the pimento cheese you use looks amazing- can you share the brand you get? Thanks! This pimento was brought over by a friend, so I’m not sure where she got it. It can be hit or miss though! I usually get some from the bakery. those cakes in a jar sound yummy!! 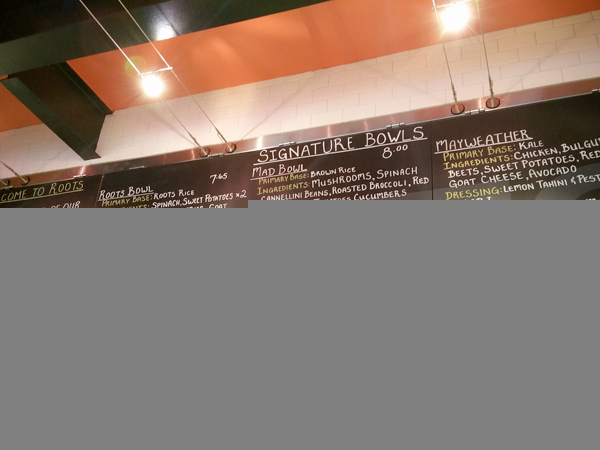 That barbecued tofu looks so yummy…and that menu, wow! 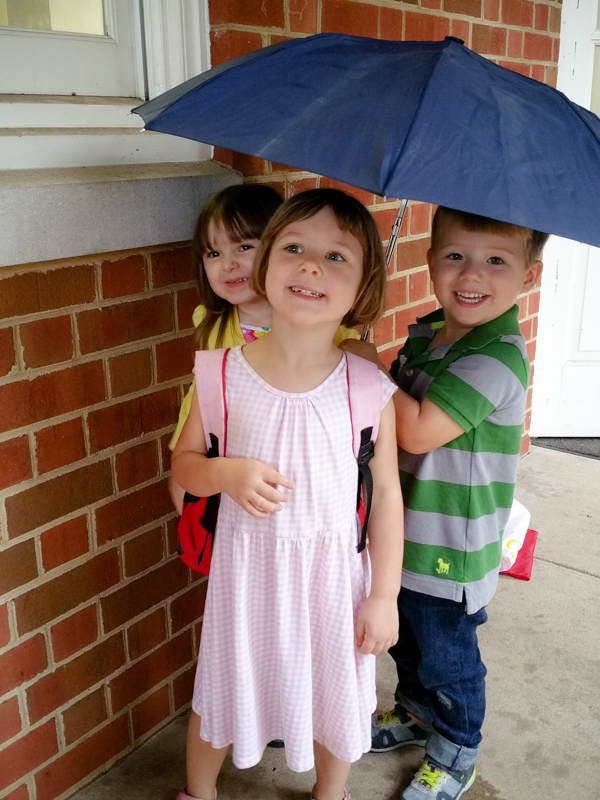 Love the photo of Mazen and his friends with the umbrella, definitely sums up my week as well! Rain, rain, and more rain! 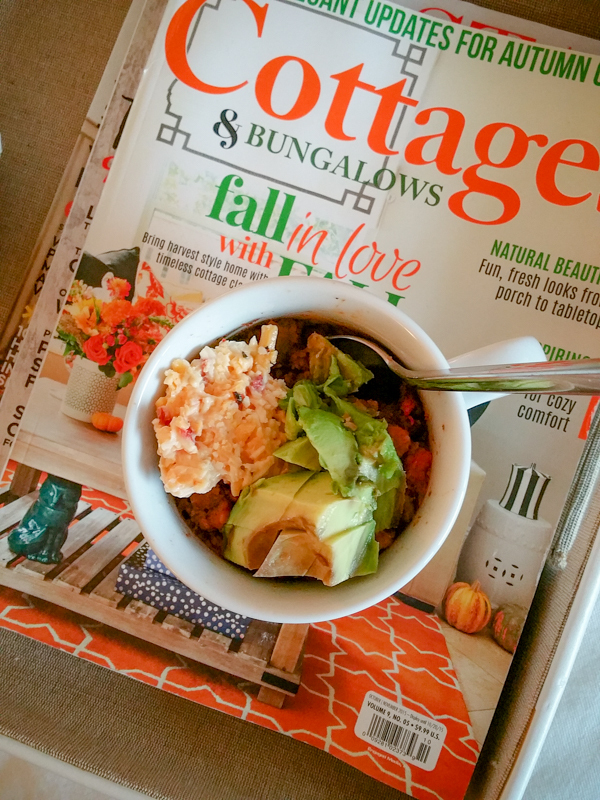 What a great idea to stir pimento cheese into your chili! That is some restraint!! I’d have to give in and just eat the whole lot, maybe for dinner 🙂 New lunch place looks fab!!! I notice you don’t shy away from dessert, and I understand there’s a good balance there… but as an RD what are your thoughts on the recent studies showing just how harmful sugar can be? I don’t think sugar is good for you, but I also don’t think in the context of a healthy diet it’s all that bad. Keep in mind that all carbohydrates break down to glucose in the blood stream so it’s more of a matter of context and glycemic load than it is sucrose as a chemical itself. What would be a good dessert that wouldn’t have a high glycemic load? Sometimes you just gotta have something sweet! So maybe something like pecan pie with protein from the nuts or cheesecake with a high fat content would be ok? Yes, but Pecan Pie is very dense with sugar and calories so i’d say one bite!! A better choice would be strawberries with fresh whipped cream or banana soft serve with some dark chocolate. We had so much rain last week. Thankfully this week it’s sunny! That new restaurant looks so so yumm! What a perfect lunch spot! That is the cutest pic of Mazen holding the umbrella for the girls! Adorable children! You seriously have the best restaurants in CVille. I live in LA and restaurants aren’t as good!